MALAKHOVKA, Russia ““ In Soviet times, the small town of Malakhovka, less than 10 miles from Moscow, was the center of Jewish underground activity. In 2005 its old wooden synagogue was burned down in a fire – for the second time. Five years later, the shared effort of local authorities and wealthy Moscow Jews have enabled the building of a new synagogue. The synagogue was built with the financial backing of Moscow businessman Alexander Kaplan, who said he felt a break in tradition upon learning that the old synagogue had been burned down and wanted to bring it back. Kaplan had grown up in Moscow, but his relatives lived in Malakhovka, and as a child he spent summers with them. Local authorities had allowed the Jews to pray in the former administration building and they did not miss a single Shabbat service, one of the community leaders, Mikhail Glimcher, told JTA. The officials also endorsed a plot of land to build a new synagogue without delay. “They understand it’s better to be friends with us because elections happen,” said Glimcher, the former community head who is seen as the main force behind the new construction. Representatives of the local authorities were on hand for the opening ceremony. The head of administration of Malakhovka, Alexander Avtaev, presented the community with a big gilded key and Lazar with a bunch of white roses. All the citizens of Malakhovka “were upset to know that the synagogue had been burned, and looked forward to the opening of a new one,” Avtaev said. The building also will house a community center, a mikvah, dining hall, and chess and women’s clubs for a Jewish community of approximately 400. The synagogue sits in a Moscow suburb known for two reasons: Malakhovka has played host to the summerhouses of many famous artists, and historically it has been populated by Jews. Old-time residents recall that some 50 years ago, one could hear Yiddish spoken in local shops. In a town of about 18,000, some streets were populated entirely by Jews. It isn’t clear why Malakhovka became such an attraction for Jews, but it’s likely that Jews had begun to settle here, outside the Pale of Settlement, even before the 1917 revolution. Some speculate that local authorities were loyal to Jews. Today’s Malakhovka residents prefer to think that the Jews chose Malakhovka simply because of its beauty. Surrounded by pine groves, the town wins high marks in real estate ratings. Also, trains make it easy to reach the center of Moscow. Another popular conjecture is that Jews liked the place because of a big market held here on weekends. “When a morning train would come on Sunday, local anti-Semites would go to the platform shouting ‘Berdichev has come! '” recalls Eugenia Umanova, 79, who has spent her whole life in Malakhovka and worked as a doctor at a local clinic. Berdichev is a small town in Ukraine inhabited mainly by Jews. From 1919 to 1922, Marc Chagall taught here in a Jewish orphan colony. In the late 1920s, the sixth Lubavitcher rebbe spent three weeks in Malakhovka, living in the house of a Lutheran woman who let Jews pray there. 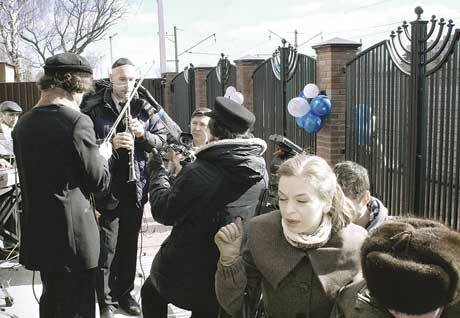 The synagogue became state property, and Malakhovka Jews continued to pray secretly. In 1959 the synagogue was set ablaze for the first time. The Jewish community reconstructed the building in the 1970s, and in 2005 it became the community’s property. But just two months later the building was burned down again: A drug addict broke in looking for valuables and then set the house on fire to cover his tracks. That’s unlikely: Shabbat services in the old synagogue typically attracted 20 to 30 worshippers, with the average age of participants being well over 60.